If you&apos;re looking for a Caribbean honeymoon that combines relaxation, culture, and adventure, check out the charming island of Martinique! If you love the charm of Paris, but prefer the weather of Florida, then you’re in a luck: a Martinique honeymoon can offer all of your favorite things. As part of the Lesser Antilles, don’t expect flat lands at this Caribbean destination. Martinique is characterized by various mountain ranges–including an active volcano!—and features sweet little towns that’ll remind you of the beautiful streets in France. Not to mention robust and vibrant gardens and of course, white sandy beaches for celebrating the start of your marriage. If you’re considering a Martinique honeymoon, consider this your everything-you-need-to-know guide to planning and enjoying every last second. Anywhere in the Caribbean features nearly year-round warm temperatures. This makes it a vacation spot for every sun-chaser in need of Vitamin D. However, for the best Martinique honeymoon, set your sights on the month of May. Here, you can expect breezy, comfortable weather that isn’t too hot or sticky. Keep in mind there is a slight chance of hurricanes during the summer and fall months, so you may run the risk of having to cancel last-minute. To avoid super-steep prices thanks to an influx of tourists, avoid the peak season between December and April. Pack some hiking boots, your bikini and an appetite, since there is plenty to do in this Caribbean town with French accents. Be romanced at Fort De France: As the capital city of Martinique, it’s recommended to spend a few days here and pretend you’re actually in The City of Lights. It sure feels that way with the scent of freshly-baked bread and croissants swirling through the air, boutiques on every corner and a busy Covered Market, with local artisan crafts and French-Caribbean folklore goods. Explore St. Pierre: It’s been nicknamed the Paris and the Pompeii of the Caribbean—and for good reason. Featuring ruins and seaside eats and streets, there’s a dreamy and dark vibe to this city, making for an interesting leg of your honeymoon. Take photos at the Balata Botanical Gardens: If you’re looking for a prime spot to take your we-just-got-hitched photos during your Martinique honeymoon, consider sneaking in a smooch in from of the estimated 3,000 tropical flowers and plants at Jardin De Balata. You can spend an afternoon walking across rope brides that dangle through treetops, providing stunning views of the area. Have a day at Les Salines: You can’t enjoy a Martinique honeymoon without relaxing by the beach! As one of the top-rated beaches is this one, which is named after a salt pond that lingers nearby. It’s popular, but still relatively quiet, surrounding by palm trees and plenty of shade if you need it. Learn about history at Les Trois-Ilets: Not everyone is a history fan when they travel, but if you and your spouse are buffs while on the go, consider this a must-see. You’ll learn about the pottery and sugarcane industries that defined the island, all while enjoying local fare and boutiques, too. Take a cruise through Fort-de-France Bay: Under the Caribbean sun with The One is a no-brainer for your honeymoon. Book one of the many boats—from sailing to catamarans—and have a day of dolphin-watching and mangrove forest exploring. Be fascinated at Château Dubuc: During the 18th century the Dubuc family owned Martinique, and today, you can explore the ruins of their opulent home. While some of the history details a troubled past, the home is an impressive wonder to navigate. Spend a day at Sainte-Anne: This southernmost village is beloved by tourists, since it feels like a step back into a time long ago. After touring the quaint shops, you can spend the day at the beach or go for a hike on the many trails from Anse a Prunes. Hike a volcano: More than a century ago, Mount Pelee erupted, creating grave destruction to Saint-Pierre. 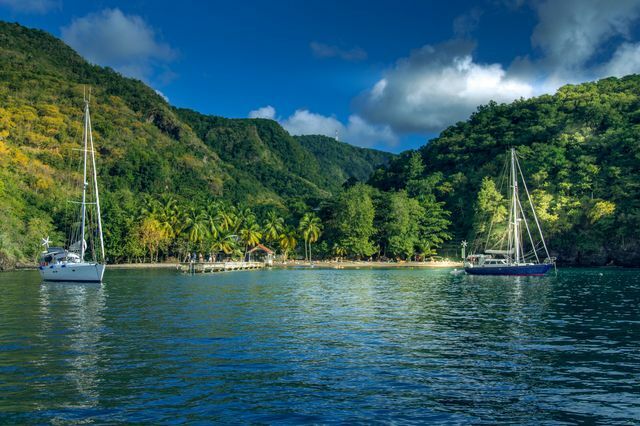 Today, it’s in a quiet phase, which allows honeymooners to hike to the top and enjoy panoramic views of mountains, the Atlantic ocean and even the island of Dominica. Witness Diamond Rock: Considering your left hand is now home to a diamond of your very own, why not see an island named after this prized gemstone? It’s only three kilometers off the coast, and was a place where a tragic shipwreck killed sailors and slaves from Britain. You can take a boat tour to learn more during your Martinique honeymoon. Go back in time at Musee de La Pagerie: Napoleon’s empress, Josephine was born here, and the stone cottage has been restored to detail their romantic tale. From a marriage certificate to love letters, this arranged marriage has more history than you realized.